Sigma: What made you want to start a career in the cosmetic industry? Amanda: I started doing makeup in the mid-nineties after becoming very inspired by a training I went to that was led by a makeup artist. I had a few jobs for various lines while I worked in creative fields, but I always found myself coming back to makeup. Then I started working for a major cosmetic line and was there for over nine years in management. I have always been drawn to and inspired by color and texture, and the combination of the two. Makeup has no rules; there are so many things that you can do with color and placement -- cool and warm, light and dark. 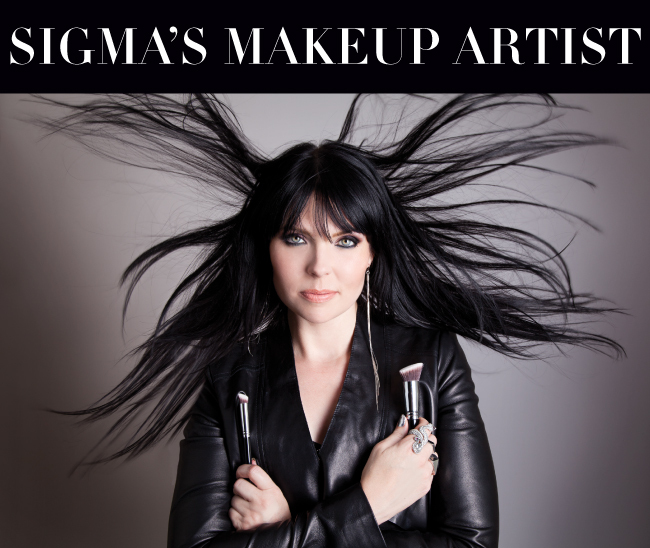 Sigma: What has been your most rewarding experience during your tenure as a makeup artist? Amanda: Making people feel beautiful and transformed. It’s an amazing feeling to help someone with their confidence and make them feel better about themselves. So often we as women are more critical of ourselves then we would ever be of someone else. Also, I enjoy showing people how to love and embrace color. I'm a fan of neutrals, too, but variety is the spice of life and sometimes the smallest bit of color makes the biggest impact! Sigma: What's your favorite part about working here at Sigma? Amanda: Possibility! Not only do I get to work with great people, but there is always excitement in the air because of all the ideas and inspiration. Every day is fun and creative -- there are amazing things to come at Sigma! I have the pleasure of waking up and being able to say that I am excited to come to work and that makes me feel very lucky. Sigma: What are your top makeup must-haves? Sigma: What's your favorite facial feature to accentuate? Amanda: Right now, cheeks. In the fall it will probably be lips. Amanda: Stay out of the sun and always wear sunscreen. Sigma: How do you define beauty? Sigma: Who is your favorite beauty icon? Amanda: I cannot answer that with just one answer. I love Tori Amos for her versatility and her confidence (plus I always wanted her hair), Brigitte Bardot, Meryl Streep, and Micheline Pitt. There are countless others, but these few come to mind first. Now that you've gotten to know a bit about our makeup artist, what would you like to ask Amanda? Whether it's a question on beginner basics or how to create a classic cat eye, she'll give you an answer! Simply send your questions our way for the upcoming "Ask Amanda" blog posts either by leaving a comment below or sending an email to amanda@sigmabeauty.com. Who or what inspired you in becoming a makeup artist? What were some of the road bumps you encountered on the way in pursuing your career? I've recently decided to pursue makeup by planning to enroll in a makeup course in order to learn and improve on different techniques used in makeup artistry. As an aspiring makeup artist myself I've had someone very close to me discourage me in pursuing makeup because it's not practical. I want to take this leap into the makeup world and see where it takes me. Any words of encouragement for someone who's being told otherwise? Thank you for your questions, Heidi! Amanda will definitely be answering some of those in her upcoming "Ask Amanda" posts! :) Stay tuned!